Obsessively putting our comics in chronological order since 1985. Cover prices are raised from $.12 to $.15. At least you "don't have to fumble around with pennies," says Stan. Also this year (announced in the October Bullpen Bulletins) , the decision is made to abandon the policy of continued stories. All stories will now be contained in a single issue, with the exception of some currently ongoing stories and those rare occasions where a two parter is absolutely necessary. Stan says that fan opinion on continued stories was about 50/50 and he's decided to now favor the other 50. I believe one factor was that in these days before comic book shops, it wasn't always guaranteed that you'd be able to find a given issue. While this makes chronological placement easier, it also results in less complex stories and hurts the quality of the line. Spider-Man continues to be the best comic of the line by leaps and bounds. This is due to a large cast of well developed non-super powered characters and the willingness to focus more, or at least equally, on the character side of Peter Parker than the action side of Spider-Man. Stan's writing isn't perfect, but it's much more down to earth and realistic here than the writing on any other book. When other books attempt to address social issues, it feels really clunky. Here, it almost works. If Romita was able to do full pencils instead of just breakdowns, this era would be remembered as truly classic. There's a neat alliance between Egghead, the Mad Thinker, and the Puppet Master that had the makings of an unofficial crossover across a few books (i call it the "Evil Alliance" crossover based on a footnote in one of the issues) but it never actually goes anywhere. Creator notes: Jack Kirby's workload shrinks further as he leaves Captain America. He is doing just Thor and Fantastic Four now. 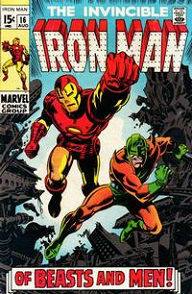 Jim Steranko does a few issues of Cap which are awesome but then he's gone as well. Neal Adams has a short but great run on the X-Men prior to the cancellation of that series. Galactus fights Ego the Living Planet! Dr. Strange starts dressing like a super-hero. New characters: Other than the Falcon, not a lot of significant first appearances: Madame Hydra, Man-Ape, Controller, Man-Mountain Marko, Silvermane, the Squadron Sinister, Stingray, Prowler. This may be the result of the Marvel Universe having matured as much as a lack of creativity. 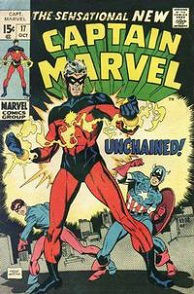 Captain Marvel #15-17 Captain Marvel gets his classic costume. Rick Jones becomes bound to Mar-vell. 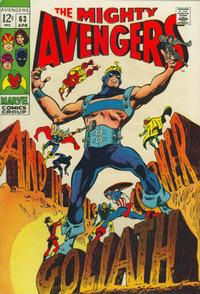 Avengers #69-71 1st Grandmaster. 1st Squadron Sinister (incl. Nighthawk).